The First International Family Nursing Conference was hosted in May 1988 by the University of Calgary, Faculty of Nursing and chaired by Dr. Lorraine M. Wright (450 participants from 15 countries attended this first conference). In 2015, the 12th International Family Nursing Conference hosted by the International Family Nursing Association took place in Odense, Denmark which marked 27 years since the First International Family Conference in Calgary in 1988. The 13th International Family Nursing Conference was hosted by the International Family Nursing Association in Pamplona, Spain in June 2017. Copies of Conference Final Program and Book of Abstracts for all of the International Family Nursing Conferences are available for free public access through the institutional repository named Prism, University of Calgary Library, Family Nursing Unit Collection. For the links to all archived conference programs, see below. Here is a brief description of the past and future International Family Nursing Conferences, including sponsors, conference chairs, number of participants, and related publications. Updated September 2017. A book of selected papers was published from the 2nd International Family Nursing Conference: Feetham, S.L., Meister, S.B., Bell, J.M., & Gilliss, C.L. (Eds.). (1993). The nursing of families: Theory/research/education/practice. Newbury Park, CA: Sage. This was the second official meeting of the International Family Nursing Association who organized and sponsored this conference 458 participants from 31 countries. (IFNA Conference Committee: Kathleen Knafl, PhD, FAAN, co-chair; Janet Deatrick, PhD, RN, FAAN, co-chair; Marcia Van Ripers, PhD, RN, [IFNA Board Liaison]; Regina Szylit Bousso, PhD, June Horowitz, PhD, RN, PMHCNS-BC, FAAN, Hanne Konradsen, PhD, Jane Lasseter, PhD, RN, Helene Moriarty, PhD, RN, PMH, CNS-BC, Birte Østergaard, PhD, Veronica Swallow, PhD, MMedSCi, BSc (Hons), RGN). For more details about the conference on the IFNA website see: http://internationalfamilynursing.org/2013/07/11/2015-conference/. 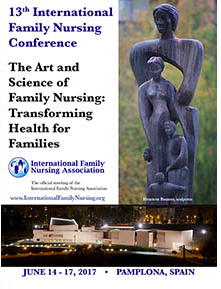 Conference Brochure: http://internationalfamilynursing.org/2015/04/22/brochure/. This conference was the third official meeting of the International Family Nursing Association (IFNA Conference co-chairs, Dr. June Horowitz and Dr. Jane Lassetter); For more details, see IFNA website. There were 329 participants from 29 countries.